Professor Steinemann’s research continues to investigate why fragranced product emissions are associated with such a range of adverse and serious health effects. In the meantime, for solutions, Professor Steinemann suggests using products that do not contain any fragrance (including masking fragrance, which unscented products may contain). She also recommends fragrance-free policies within buildings and other places. “It’s a relatively simple and cost-effective way to reduce risks and improve air quality and health,” she explains. Of the 34.7 % of the population reporting adverse health effects, 56.1 % are female and 43.9 % are male. (l) Other health problems (1.7%). Of the general population, 17.2 % reported yes, indicating that the severity of effects from fragranced product exposure was potentially disabling. Fragranced products restrict access in society. 22.7 % were unable to go someplace because of the presence of a fragranced product. 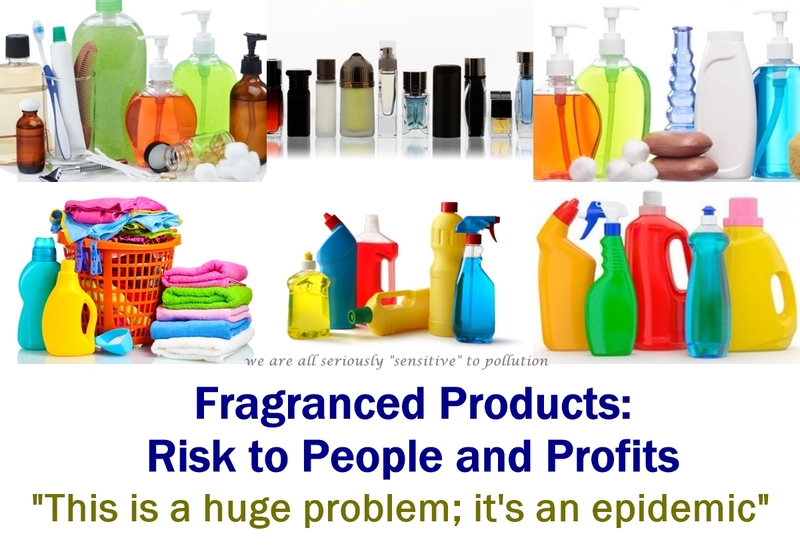 15.1 % have lost workdays or a job due to fragranced product exposures in the workplace. Importantly, adverse effects resulting from exposure to fragranced products, such as in workplaces and public places, raise concerns about liability. For instance, individuals can suffer acute health effects, such as an asthma attack, if they enter a restroom that uses air fresheners. If they are unable to access a restroom due to the presence of an air freshener, then that poses a potential violation of the Americans with Disabilities Act. Fragranced consumer products are exempt from full disclosure of ingredients to the public. For air fresheners, cleaning supplies, laundry products, and other consumer products, labels are not required to list all ingredients, or the presence of a fragrance in the product. For personal care products and cosmetics, labels are required to list ingredients, except the general term “fragrance” may be used instead of listing the individual ingredients in the fragrance. For all products, material safety data sheets are not required to list all ingredients. Fragrance-free policies within buildings and other places are a relatively simple and cost-effective way to reduce risks and improve air quality and health. This entry was posted in Accessibility, Air Quality, Environmental Health, Fragrance, Human Rights, Policy, Public Health and tagged allergies, Anne Steinemann, asthma, chemical sensitivity, environmental sensitivities, epidemic, fragrance-free, hazardous air pollutants, health, IAQ, invisible disabilities, MCS, MCS/ES, petrochemicals, Research. Bookmark the permalink. One would think those stats would get someone’s attention. The sad thing is that the last four people who have come to my house all go fragrance free and yet all couldn’t stay at my house because their clothes were “loaded” with toxic chemicals because they had been out with the general public. Except for one article on YAHOO, the North American media has totally ignored these important research findings. At least with internet they can’t bury it completely. Truth will win out in the end. I sometimes wonder if human brains will last that long? People don’t understand how quickly our environment can change to a dangerous one. I just left my mom’s. I was there about 20 min. I went in no toxic scent. I left a neighbor had started doing laundry — now I have hives and an itchy tongue. Hope your squirrels make you laugh today and some fresh air comes your way. Who needs foreign terrorists when we can be gassed right at home (or at mom’s home)? The squirrels, blue jays, and crows bring me some joy every day when I feed them, thanks to the store manager who delivers nuts and seeds every month. The other birds and little ones I love too but try not to encourage them due to the neighbor’s killer cat getting so many of them. We have a long way to go before enough people take responsibility for their actions (in all levels of society) so that it’s a safe and healthy planet for all of us. What kind of world would it be if we all agreed to “do no harm”? It’s absolutely fascinating that so few people actually take these stats seriously. I feel like I have these conversations on a daily basis with people who all understand what I’m saying yet they refuse to take action.